Egypt's oldest pyramid has been saved from ruin thanks to a team of Newport engineers. 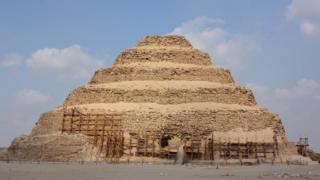 The 4,700-year-old Step Pyramid of Djoser was at risk of collapse after an earthquake hit Egypt. British structural experts Cintec were hired in 2010 to shore up the pyramid, believed to be the first large stone building on earth. One engineer said he had to crawl on his stomach to repair walls crumbling in front of his eyes. Dennis Lee, 59, said: "It was nerve-wracking. It's not a crumbling wall in front of you, it's right over your head. "It's also very historic so you have to take everything very slowly." The £7m project to repair the partially-collapsed burial chamber and its crumbling walls faced setbacks. Engineering firm Cintec battled extreme heat, vandalism and political unrest in Egypt, but nine years later the firm has completed its mammoth task. Much of the damage was done when an earthquake hit the pyramid in 1992, and the repair project was agreed by World Heritage and Egyptian antiquities chiefs. Mr Lee said their work exposed the pyramid's sarcophagus - the coffin which at one point held the mummy of the Pharoah Djoser - for the first time in hundreds of years. There was no mummy found during the repair. To repair the ceiling the firm used giant air bags to hold it in place before knitting it back together with more than 100 steel rods. Mr Lee said their work would have been completed sooner, but it was initially delayed by the Arab Spring in 2011. "During the revolution many of the pyramids and museums were plundered - we were lucky because even though our equipment was in Egypt it hadn't yet cleared customs. "For the past six years I would travel to Egypt and work over there for spells between four to six weeks and then return. "At one point I had about 13 visas in my passport - maybe more."